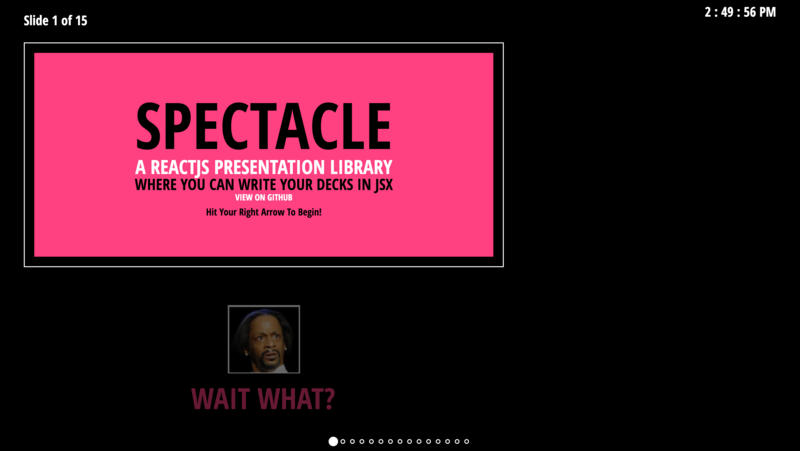 The new best way to get started is by running create-react-app my-presentation --scripts-version spectacle-scripts. This will use create-react-app to create almost everything you need. This however, doesn't include publish scripts, and ejecting is required for fancy stuff. 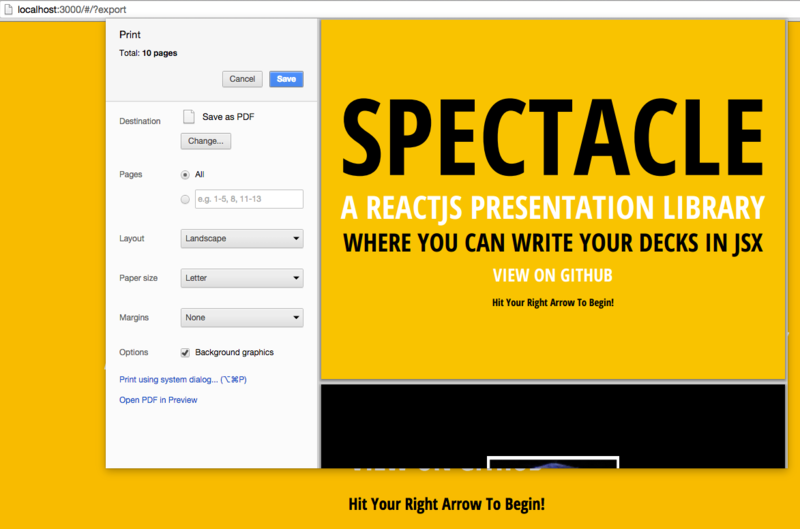 The second best way to get started is by using the Spectacle Boilerplate. Alternatively, you can npm install spectacle and write your own build configurations. We also provide full UMD builds (with a Spectacle global variable) of the library at dist/spectacle.js and dist/spectacle.min.js for more general use cases. You could, for example, include the library via a script tag with: https://unpkg.com/[email protected]/dist/spectacle.min.js. Note that we have webpack externals for react, react-dom, and prop-types, so you will need to provide them in your upstream build or something like linking in via script tags in your HTML page for all three libraries. This comports with our project dependencies which place these three libraries in peerDependencies. But really, it is SO much easier to just use the boilerplate. Trust me. To aid with speedy development / kicking the tires on spectacle, we support using a simple boilerplate HTML page with a bespoke script tag that contains your entire presentation. The rest of the setup will take care of transpiling your React/ESnext code, providing Spectacle, React, and ReactDOM libraries, and being raring to go with a minimum of effort. There are no imports or requires. Everything must come from the global namespace. This includes Spectacle, React, ReactDOM and all the Spectacle exports from ./src/index.js -- Deck, Slide, themes, etc. The presentation must include exactly one script tag with the type text/spectacle that is a function. Presently, that function is directly inserted inline into a wrapper code boilerplate as a React Component render function. The wrapper is transpiled. There should not be any extraneous content around it like outer variables or comments. ... with those guidelines in mind, here's the boilerplate that you can literally copy-and-paste into an HTML file and start a Spectacle presentation that works from the get go! Next run rm -R .git to remove the existing version control. ⚠️ If you are deploying the dist version to GitHub Pages, note that the built bundle uses an absolute path to the /dist/ directory while GitHub Pages requires the relative ./dist/ to find any embedded assets and/or images. A very hacky way to fix this is to edit one place in the produced bundle, as shown in this GitHub issue. On your screen visit http://localhost:3000/. You will be redirected to a URL containing the slide id. You can toggle the presenter or overview mode by pressing respectively alt+p and alt+o. Fullscreen can be toggled via browser options, or by hovering over the bottom right corner of your window until the fullscreen icon appears and clicking it. Your presentation files & assets will live in the presentation folder. Check it out here in the boilerplate. Here is where you can use the library's tags to compose your presentation. While you can use any JSX syntax here, building your presentation with the supplied tags allows for theming to work properly. The bare minimum you need to start is a Deck element and a Slide element. Each Slide element represents a slide inside of your slideshow. In Spectacle, themes are functions that return style objects for screen & print. Or create your own based upon the source. index.js is what you would edit in order to create a custom theme of your own, using object based styles. You will want to edit index.html to include any web fonts or additional CSS that your theme requires. The returned theme object can then be passed to the Deck tag via the theme prop, and will override the default styles. Animated shuffling of child components. A collection of easy to use charts created in D3 for your React applications.